The first General Membership Meeting (GMM) of the 2017-18 year of Junior League of Tulsa, Inc. (JLT) was September 20, 2017 at JLT headquarters. Joy Hofmeister, current State Superintendent of Public Instruction for Oklahoma was our speaker. Joy Hofmeister was sworn in as Oklahoma’s 14th State Superintendent on January 12, 2015. As Superintendent, Hofmeister’s goals center on lowering remediation, raising graduation rates and increasing educational achievement for all students, including closing the opportunity and equity gaps facing students across Oklahoma. Hofmesister’s six goals within the strategic plan, set to be achieved by 2025, focus on getting everyone to share a common vision for Oklahoma’s education system or, as she terms, “turning the lights on at the gym.” The goals provide a pathway to make Oklahoma’s students better educated and the state’s education system more nationally competitive. 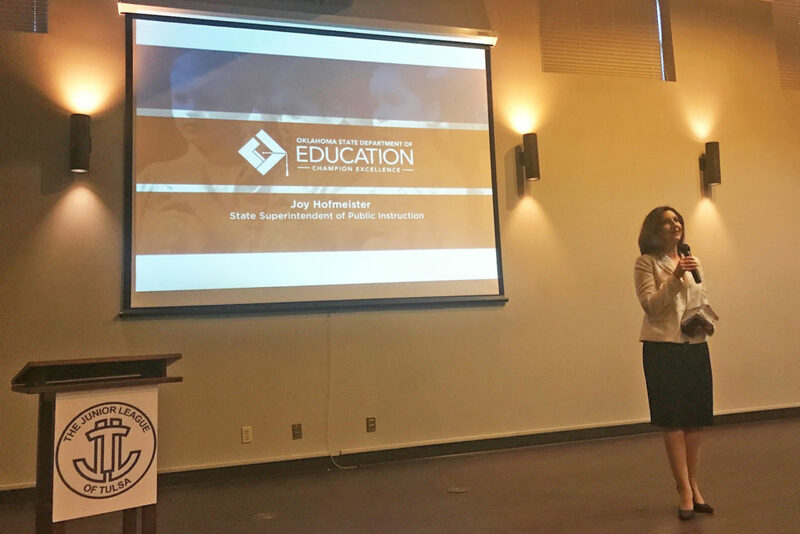 Regardless of Oklahoma’s current circumstances within education, including low teacher pay and leading the country in cuts to public spending for education, Hofmeister said it is important to create and commit Oklahomans to these goals and initiatives. Hofmeister currently serves on many other commissions and state boards. She chairs the State Board of Education and State Board of Career and Technology Education and is a regent for the Regional University System of Oklahoma, as well as a serving member on the Board of Equalization, Commission of the Land Office, Oklahoma School of Science and Mathematics, and Oklahoma Partnership for School Readiness/Smart Start Oklahoma. She previously served on the Oklahoma State Board of Education, as an appointee of Governor Mary Fallin from January 2012 to April 2013. A former public school teacher and small business owner, Hofmeister is no stranger to the Tulsa area, as she previously spent 15 years as owner of Kumon Math & Reading Center of South Tulsa. She served on the board of directors for the Jenks Public Schools Foundation and the Select Committee for Study of School Finance. She is the mother of four, all of which are graduates of Oklahoma’s public school system. She still maintains a residence in Tulsa with her husband, the Honorable Gerald L. Hofmeister.